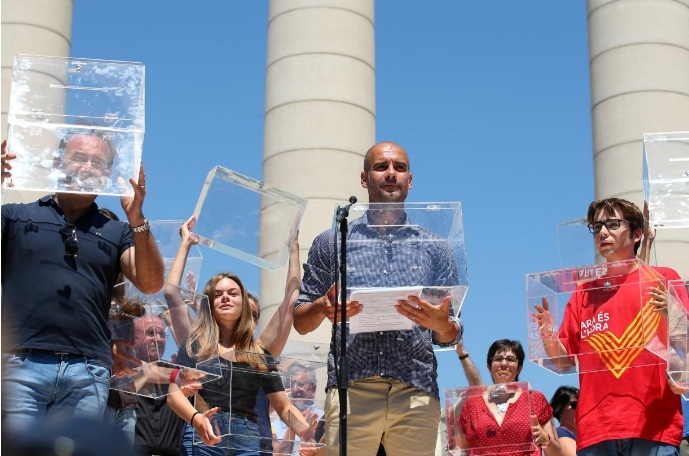 FILE PHOTO - Manchester City's manager Pep Guardiola holds a ballot box during a pro-independence rally in Barcelona, Spain June 11, 2017. MADRID - Armed police in Spain have raided several print works and newspaper offices in Catalonia in recent days in a hunt for voting papers, ballot boxes and leaflets to be used in an Oct. 1 independence referendum which Madrid vehemently opposes. The raid led to an impromptu crowd gathering outside the building, with people singing the Catalan anthem and waving slips of paper chanting ‘Where are the ballot papers?'. Images of the Catalan police force - the Mossos d‘Esquadra - seizing what for many are symbols of democracy would be highly inflammatory, police say.